During the period of 1992-2016, the total turnover of goods between Belarus and the U.S. amounts to about $8 billion. This is lower than the U.S. goods turnover with the countries neighboring Belarus. The Belarus share of the U.S. export is only 0.01% ($1.9 billion) and the U.S. import is 0.02% ($6.1 billion). Notably, the U.S. has a relatively low turnover of goods with other countries of the region as well. The specific figures are shown in Table 1 below. According to the National Statistics Committee of the Republic of Belarus, in 2008-2015 the U.S. share in the Belarusian foreign trade was less than 1% (0.15-0.46% in export and 1.21-1.47% in import). The lowest turnover between the countries was observed in 1992, and the highest – in 2008. During the period of 1992-2002, the goods turnover had been consistently growing. In 2003-2008 we can see a sharp increase of the turnover resulting from an increased export of oil and mineral products from Belarus. After the turnover downturn in 2009-2010 and growth in 2011, the trade turnover between the two countries stayed at $200-260 million during the period of 2012-2016. The U.S. export to Belarus is not significant. Consistently low trade volumes experienced considerable increases only as a result of several large transactions. Before 2002, food, technological products, and machine equipment were the main exported goods. 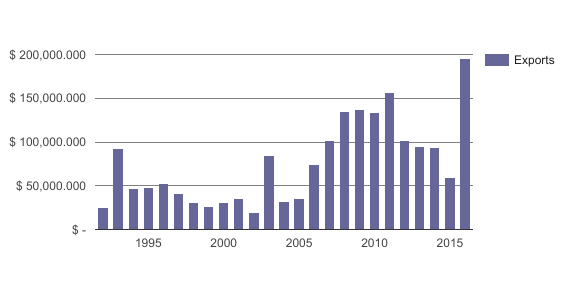 The export volume stayed within the limits of $50m a year (except 1993 and 1996). In 2003, we can see a sharp increase in the export volume, which according to www.planespotters.net is connected to the purchase of the Boeing 737-800 for the Belarus President. In 2004-2011, the U.S. export volume increased 5 times and amounted to $157m a year. In 2012-2014, the U.S. export to Belarus went down from $102m to $93m. During the years of 2004-2015, the U.S. mainly exported high-technological goods: machinery and machine equipment, transport and transportation equipment, and optical and medical equipment. These goods take 75-80% of all the goods exported to Belarus. In 1992-2002, Belarusian import increased about 5 times, from $25m to $125m. Belarusian import mainly consisted of chemical industry goods, textiles, and metals. During the period of 2002-2008, the U.S. import volumes from Belarus increased significantly due to the increased export of the oil and mineral products. The share of such products in the total U.S. export volume increased from 23% to 87%. With the decrease of the export of oil products in 2009-2010, the Belarus export to the U.S. significantly decreased and returned to the level of the first half of the 2000s. During 2013-2016, the structure of the Belarusian import had changed completely. In 2013-2014, the exports of metals comprised almost 2/3 of the total import. The volumes of optical goods were on the second place. In 2015-2016, more than 40% of the Belarusian import was taken by the chemical industry goods and metals. During the last 2 years, electronic products have taken the third position in the total Belarus export to the U.S. In 2015-2016, the share of electronic goods increased from 7% to 12%. It should be mentioned that the U.S. market has not been considered important for the Belarusian economy irrespective of the type of goods. The share of the Belarusian export to the U.S. has rarely exceeded 5% of the total Belarusian trade volume. Investments. According to the statistical data of the National Bank of the Republic of Belarus, during 2010-2015, the U.S. direct investments into the Belarusian economy amounted to $832.5m. This amount puts the U.S. on the 12th place, between Estonia ($844.7m) and Latvia ($733.2m). To compare with other countries, the U.S. invested almost €3.8 billion in Lithuania, which is about 6 times more than the U.S. investments into Belarus. This shows that the U.S. investments in Belarus can be potentially increased, provided that the relevant conditions are created within the country and the bilateral relations are approved. Belarus and the United States have the lowest goods turnover in the region, which can be explained by difficulties in the bilateral relations and the structure of the Belarusian economy. However, analysis of the U.S. trade relations with the neighboring Lithuania and Latvia and also the Belarus-U.S. trade turnover in the past gives reasons to see a possibility of growth of the trade between the two countries. The structure of trade between the two countries is asymmetrical. Technology is the main good exported to Belarus from the United States. Belarus mainly exported the goods of its processing industries and some growth is seen in the export of electronics and optical goods. A small-sized Belarusian market does not represent a strategic interest for the U.S. Belarus has a significantly bigger interest in improving the trade relations with the U.S., which can potentially become a large market for Belarusian manufacturers. Improving relations with the U.S. can give a possibility for Belarus to expand the market for selling the products of its oil refinery, metal processing, chemical, and textile industries. Improved relations can also cause the increase in the U.S. investments in Belarus. Belarus would be able to benefit from its convenient geographic location, qualified workforce, low-cost industries and access to the markets of Russia and Kazakhstan.